A rich man is looking for the perfect “Governess” (which is just a big word for a live-in Nanny) to take care of his two adopted kids, whom he has no time for. He is too busy conducting business trips and closing deals. He needs a Governess who will take care of the kids and not bother him about anything…ever! He soon finds the perfect Governess in Mrs. Giddens, the lady who ends up getting the job. Mrs. Giddens soon moves to the rich mans castle, where she will be living and taking care of the children. She is impressed at how beautiful and majestic the castle is. Apparently, things are looking up for Mrs. Giddens! She meets the children...who seem bright and cheerful, but are they what they seem? She soon discovers that there’s something not quite right about them. Why are they so damn smart? And why is the little boy hitting on her all the time? I love it when I see a good film and it blows me out of the water, and I love it even more when said film is and old one. It let’s me know that no matter how many years have passed by, if a film is good, it will retain its original impact. I love it when no matter how many years have gone by since a film was first made, when it’s good, there is just no denying it. Some films are simply forever good. The Innocents is one of these films. It’s one old school, eerie affair. I imagine that way back in 1961, audience members must have been spooked when they saw this one! 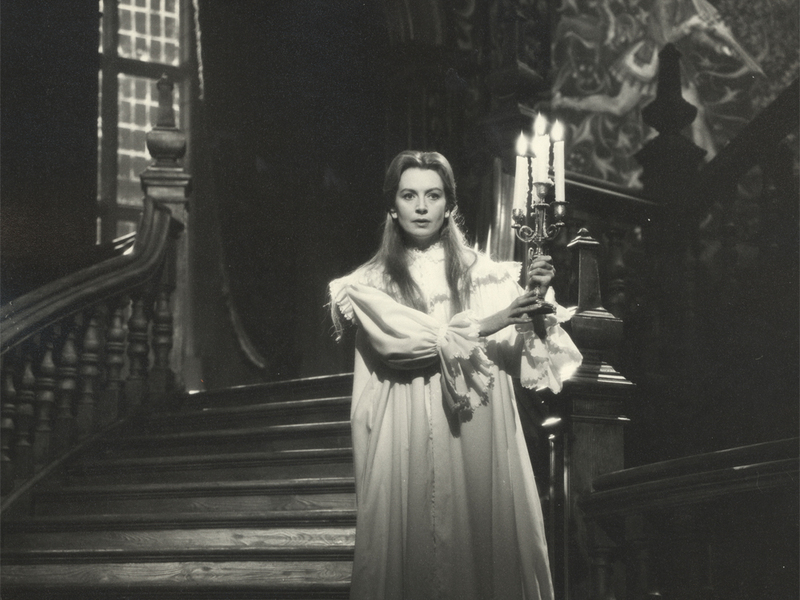 The Innocents has an intensity to it and a decidedly serious vibe that many horror films from that era lacked. It’s one of those old school horror films where the wind blows in the middle of the night, where castles are filled with dark, shadowy hallways, the window curtains caress the night air…this is an old fashion horror film alright and such a damn good one! I personally compare it to Robert Wise’s wonderfully spooky The Haunting (1963) in terms of tone and atmosphere, but more on that later. There are many scenes enshrouded in darkness on The Innoncents; the color palette is filled with sharp blacks and contrasting whites. 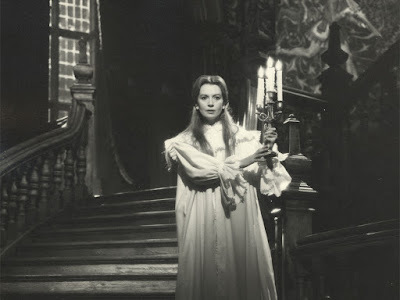 The beautifully dark and gothic look of this film can be attributed in large part to Freddie Francis, the master cinematographer who lends his abilities on The Innocents. This is the man behind the cinematography for many Hammer Horror films, he even directed some of them, like Dracula Has Risen from the Grave (1968), one of the most beautiful looking of the Hammer Dracula films. 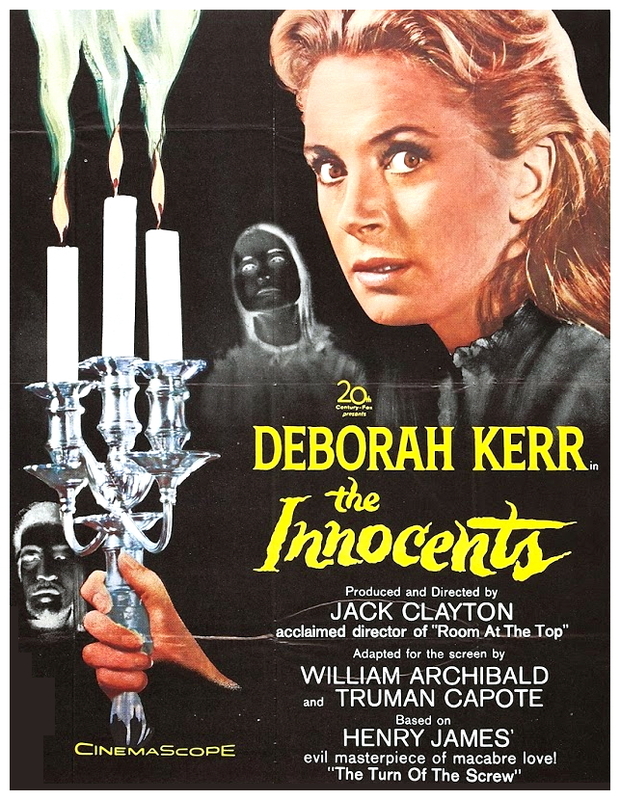 Freddie Francis’s cinematic magic worked great in color films, but he worked his magic on black and white films as well, The Innocents is a good example of that. The black and whites are as sharp as can be and used to maximum effect. When you watch this one, you feel as though you are being engulfed by darkness! It reminded me of a similar looking film that Freddie Francis directed called Nightmare (1964). By the way, Nightmare comes highly recommended as one of the better Psycho (1960) rip offs and same as The Innocents, Nightmare was a very dark looking black and white film, which consequently also starred an unreliable female protagonist. 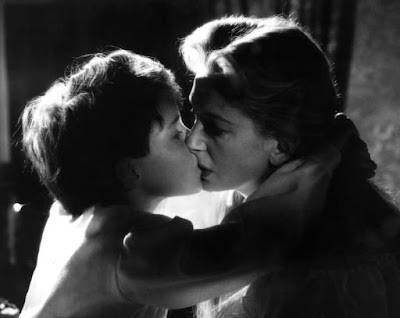 Why is Mrs. Giddens, the female lead in The Innocents considered an unreliable protagonist? It’s because she’s the kind of protagonist that we don’t really trust, she doesn’t seem to be all there. In this way it reminded me yet again of Robert Wise’s The Haunting, but also of Roman Polanski’s Repulsion (1965) and Rosemary’s Baby (1968), both psychological thrillers in which the female protagonist looses it. Actually, now that I look at it, the horror films of the 60’s were all about unreliable female protagonists, I guess this had a lot to do with the success of Hitchcock’s Psycho (1960). These are all films filled with females suffering from depression, paranoia and psychosis. The film protagonist in The Innocents fits nicely with these type of films because Mrs. Giddens seems like a competent lady; unfortunately, we are here to witness her crumble psychologically. There’s various ways of looking at this picture, it’s a film open to interpretation. 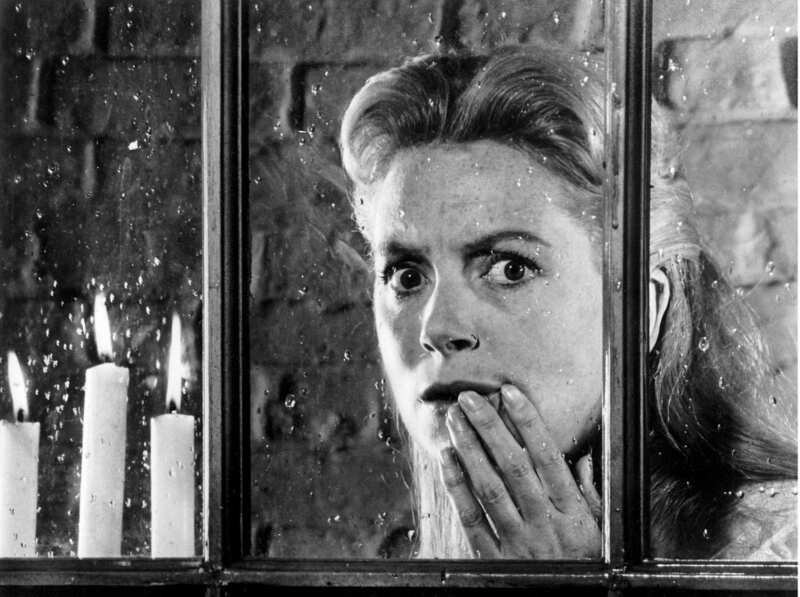 The Innocents is a very ambiguous horror film. Is it a ghost story or isn’t it? Is the house haunted? Are the kids possessed? Is Mrs. Giddens crazy? This is the kind of film where it’s never really clear exactly what is going on. 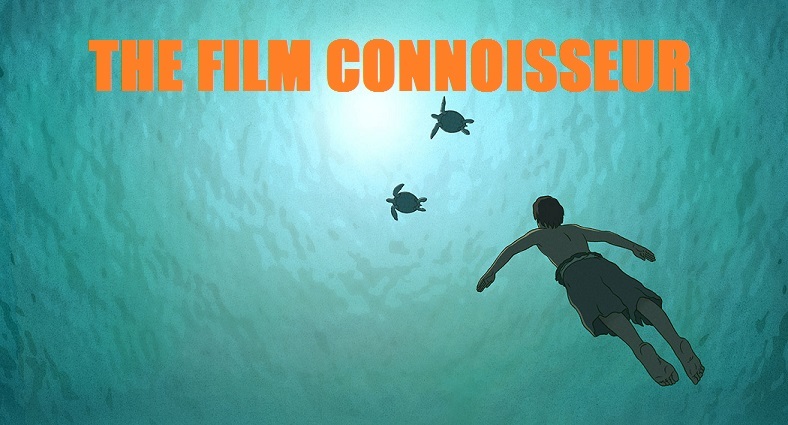 Some will see this film one way, some will see it another. At the root of it all are the children, the titular “Innocents” who really aren’t as innocent as they should be at their age, which is really the spookiest part of this film. Little Miles and Flora speak and behave like adults! They kind of reminded me of the kids in Frank Herbert’s Dune novels, where a religious order of witches breed children who are born with the knowledge of their fore fathers, so they are born super intelligent, with all this knowledge about life. Children such as these are intimidating because normally of course, kids are innocent and naïve, when they aren’t, it totally freaks you out. On The Innocents there seems to be some sort of dark purpose behind these kids’ words and actions. This is a film about corrupted youth. It plays with the idea that a child’s mind is a clean slate and that whatever we put into their minds and hearts, that whatever experiences we put them through will influence immensely on who they become. 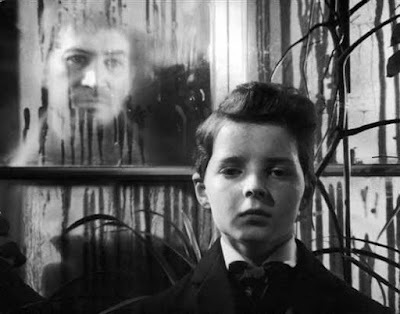 Interesting note, Martin Stephens, the child actor who played Miles on The Innocents also played one of the leads in Village of the Damned (1960), another excellent film about evil little kids. What I liked the most about The Innocents was that feeling of not knowing exactly what’s going on. I loved how the film manages to keep us lulled in to the mystery behind the kids’ strange behavior. It is a very effective film in that sense. I personally consider The Innocents one of the best horror films ever made because really, the best type of horror film is the kind that suggests the horror; it suggests what is behind that curtain and leaves the rest to your imagination. Again, this is another similarity that TheHaunting shares with The Innocents and since The Haunting was filmed a couple of years after The Innocents, I wouldn’t be surprised to find out that Robert Wise and crew where at least a bit influenced by The Innocents. In turn, I believe that The Innocents was Alejandro Amenobar’s blueprint for making The Others (2001). There is so much of The Innocents in that film! Last Halloween I did a blog post about 21 Haunted House Flicks, this one would have fit so perfectly well in there. It would have also fit nicely on my Evil Tots! MoviesWith Evil Little Kids in Them blog post. Final words? This is a true horror classic that every dignified horror fan should see. Everything about it is perfect, the suspense, the performances, the look of the film, the atmosphere. If you are disappointed with what is being passed as a horror film these days, then watch The Innocents; it’s the kind of film that will make you regain your faith in horror films.